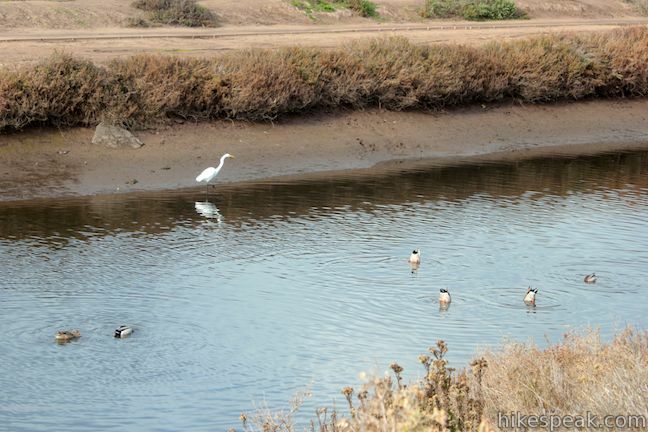 Since so much of the coastline of Southern California has been developed upon, it comes as a relief to find a 230-acre estuary that has been set aside and preserved as a vital ecosystem for shorebirds. 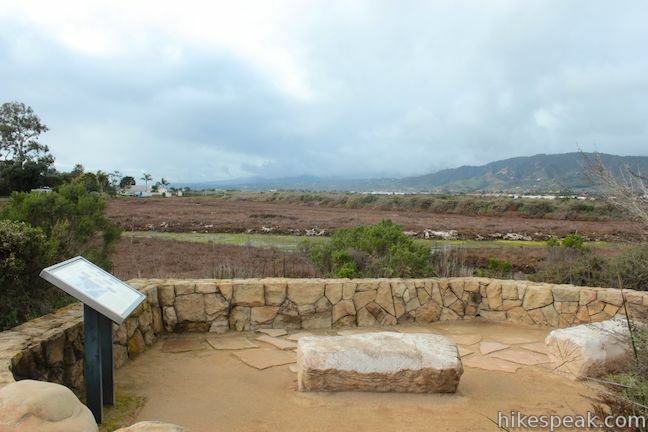 Carpinteria Salt Marsh Nature Park offers a level 1.2-mile round trip hike through part of El Estuaro past several observation areas and benches. 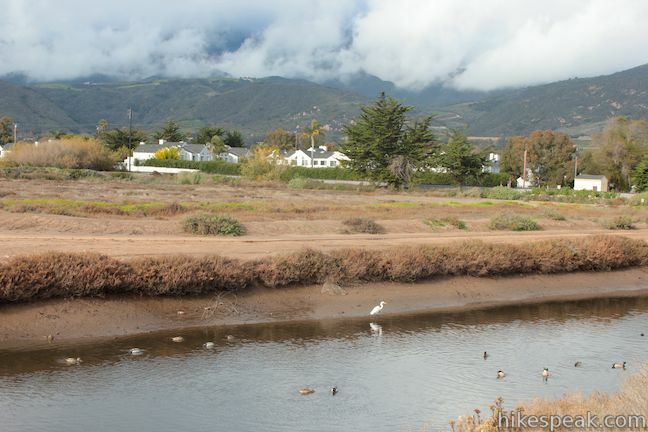 While this might not appear to be the most picturesque park on the Central Coast, it is one of the area’s most important wetlands and you have a good chance of seeing great egrets and other interesting waterfowl. 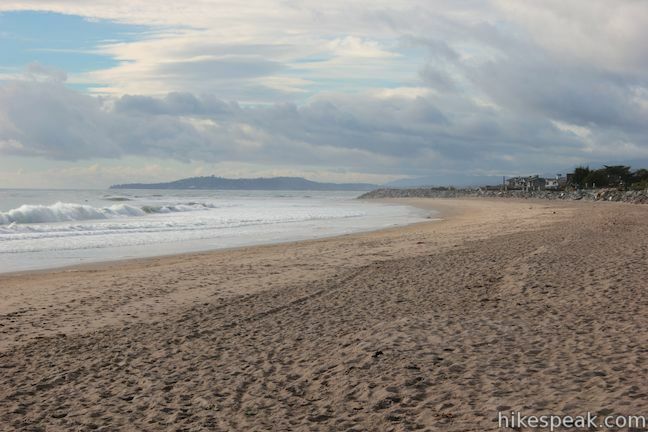 The trail begins right next to the Pacific Ocean, which means you can take advantage of beach access when you hike. 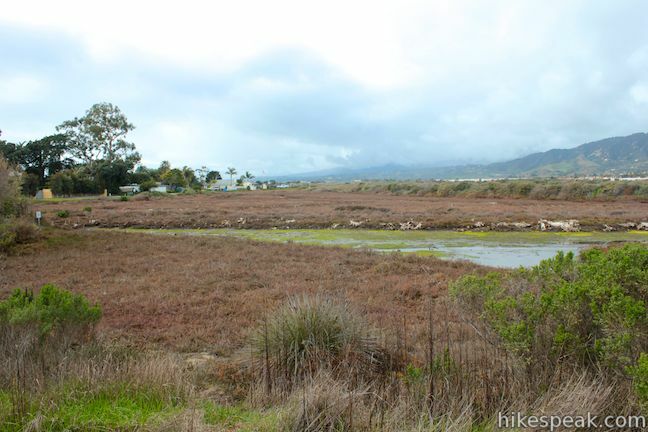 In Southern California, as much as 90% of the historic coastal wetland area has been destroyed through filling, draining, and dredging. 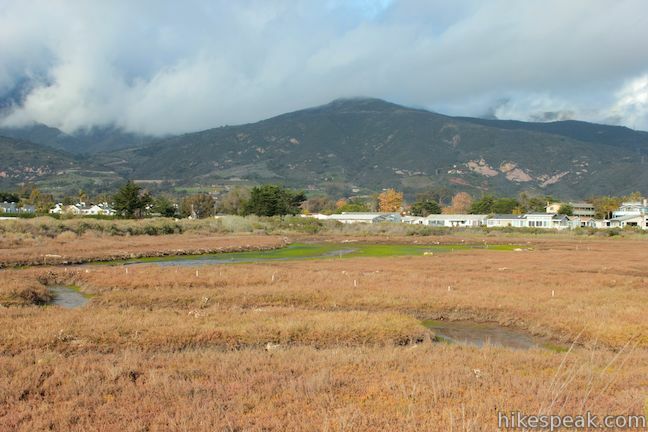 The acquisition and restoration of 15 acres of coastal habitats at this nature park is therefore significant, and an important example of the preservation of California’s natural heritage. 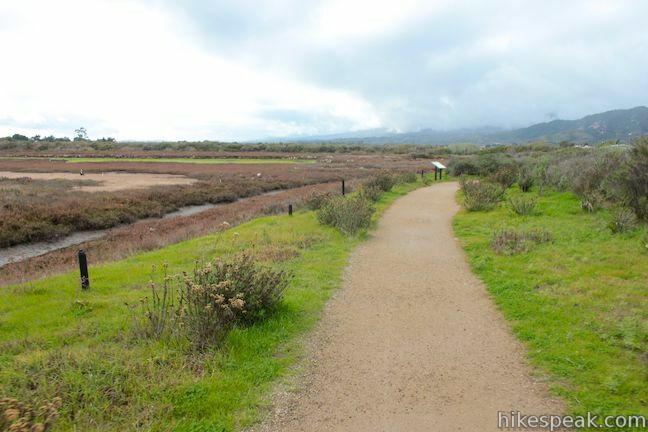 After learning about the restoration of this ecosystem, the geology of the salt marsh, and the animals who put it to use, you can either make a detour to the left down a short boardwalk to the public bathrooms and the beach, or turn right and head farther up the nature trail into the estuary. 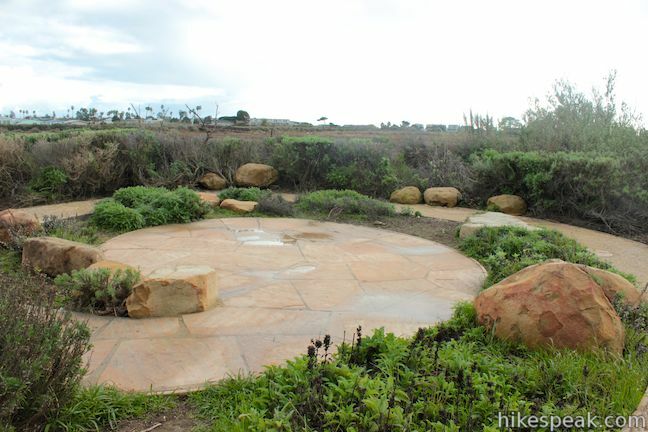 As you hike northeast up the trail, you’ll soon pass paths breaking off to the left toward a small amphitheater at another viewing area. Ahead, the nature trail makes a sharp bend to the left (as it is joined by another access trail from Ash Avenue). 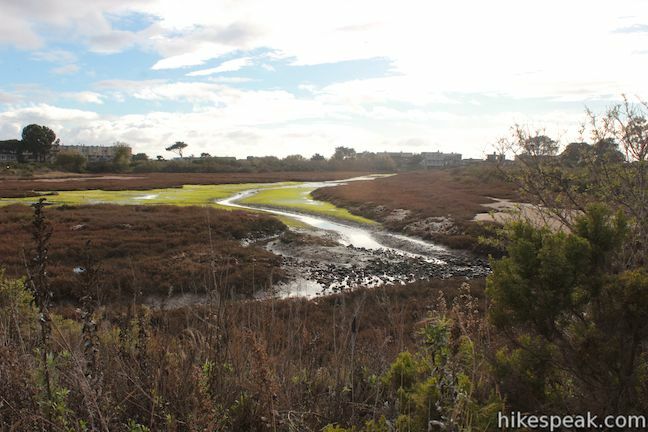 The trail pushes on alongside a housing development that borders the estuary. 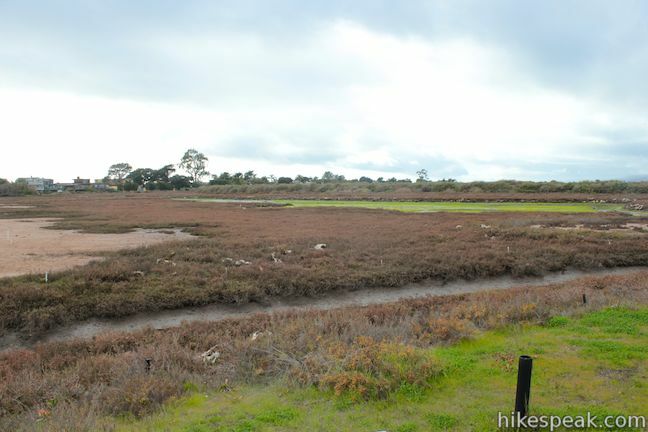 To your left, you will spot a tidal channel cutting across the salt marsh. The trail crosses Franklin Creek, a quarter mile from the start. This is the best place for birding in the park. 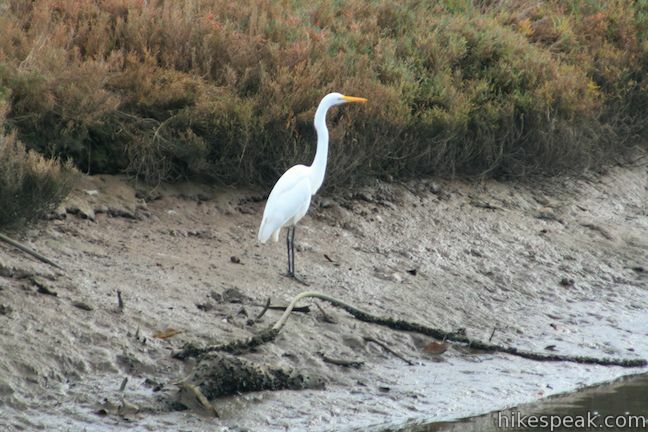 In the water below you may spot wading birds like great egrets alongside mallards and long-billed curlew. 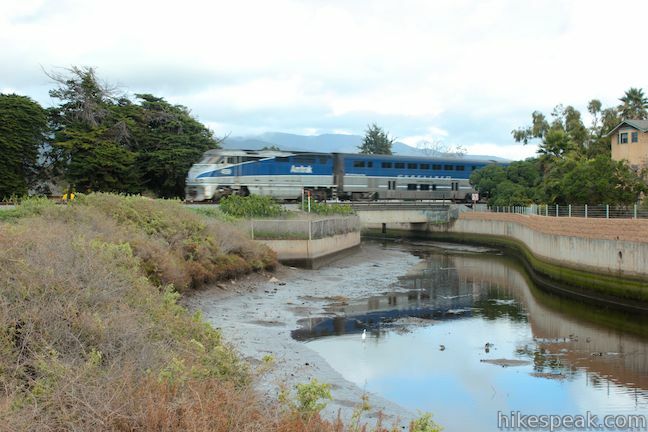 On the far side of the bridge, the trail turns to the right, heading easy along the creek before bending left along a line of railroad tracks. 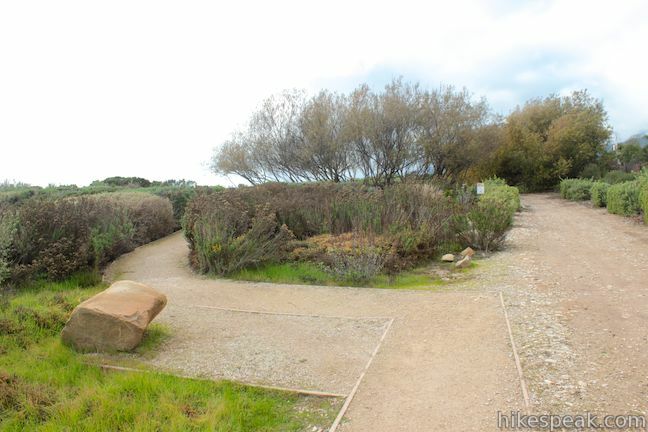 Shortly before you reach Sandy Cove Road, where public access is prohibited, take the left split out to the end of the trail, which circles in upon itself like a snail shell. 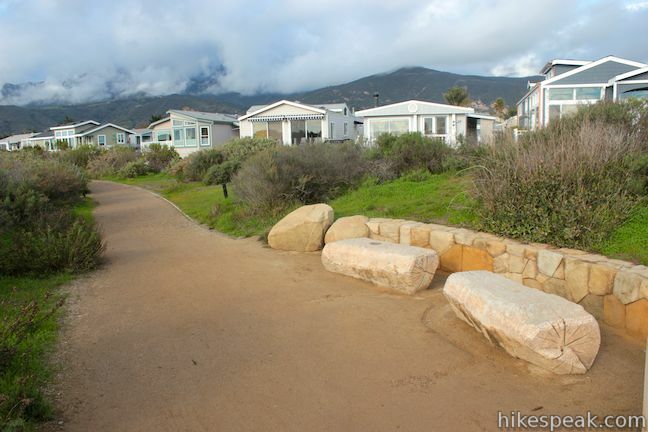 When you are ready to unwind, head back down the trail, returning 0.6 miles to the trailhead. 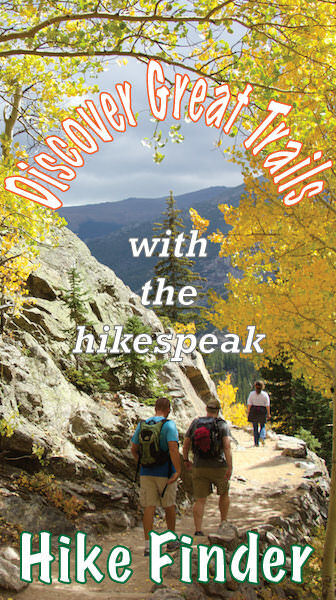 Stay on the trail and be respectful of this fragile ecosystem. 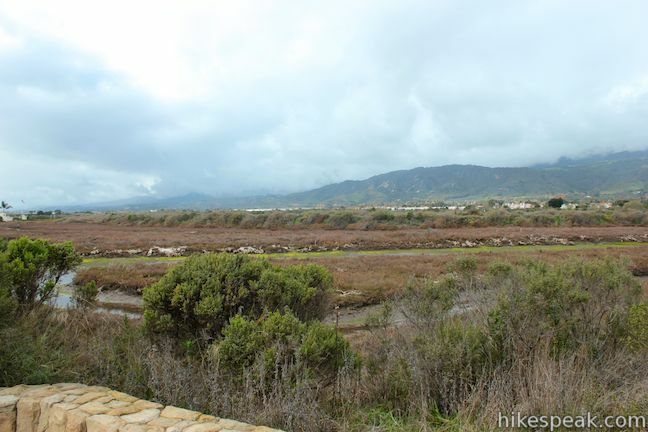 Carpinteria Salt Marsh Nature Park is a nesting ground for migratory birds. Bikes and pets are not permitted on the trail as they can disturb the wildlife. 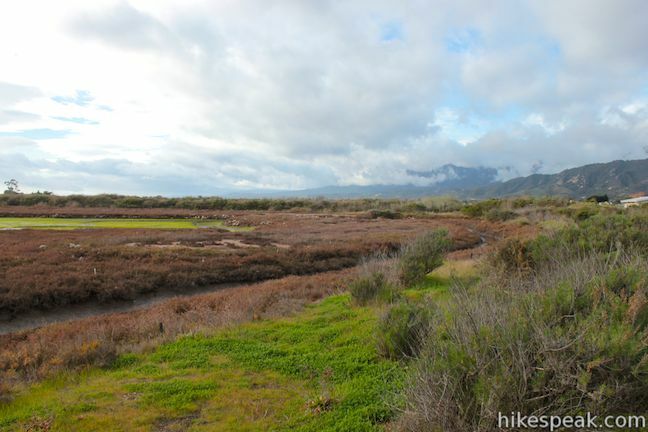 No fee or permit is required to hike in Carpinteria Salt Marsh Nature Park so get out and enjoy! 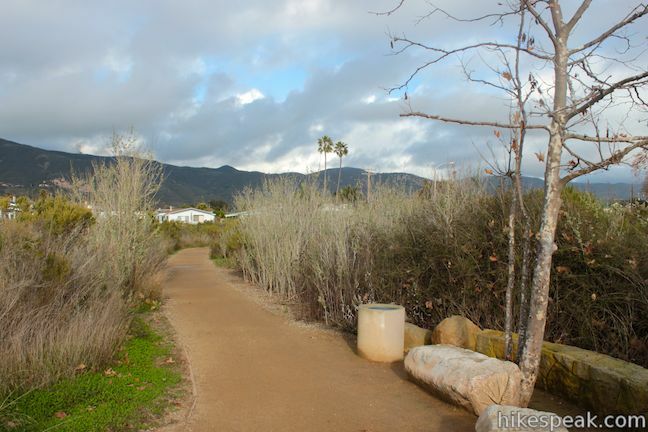 To get to the trailhead: From Santa Barbara, take the 101 Freeway south to Exit 86B for Linden Ave. Turn right (south) on Linden Ave and drive 0.6 miles to Sandyland Road. 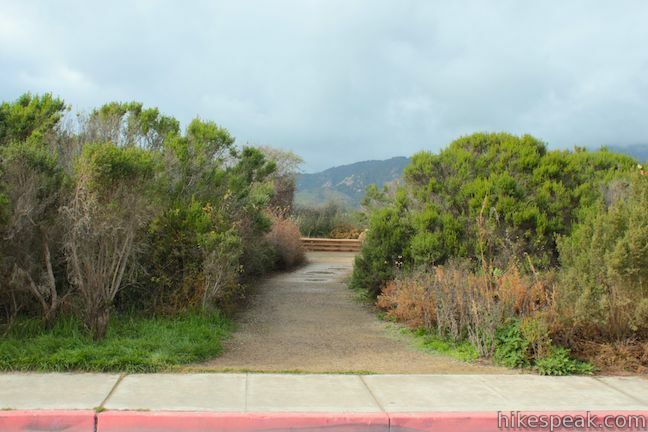 Turn right and drive 0.3 miles to the end of the road where you will spot the start of the trail in Carpinteria Salt Marsh Nature Park. Turn right and park along the street. 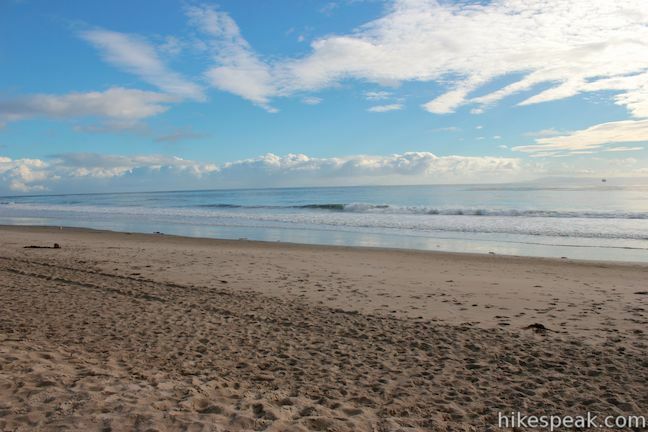 From Ventura, take the 101 Freeway north to exit 86 for Casitas Pass Road. Turn left (south) on Casitas Pass Road make the a right onto Carpinteria Ave. Drive 1/3 of a mile and turn left on Linden Ave. Go half a mile and turn right on Sandyland Road. 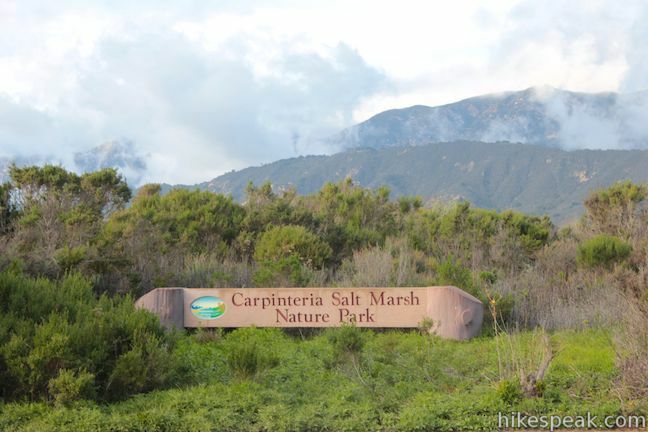 Drive 0.3 miles to the end of the street where you will spot the start of the trail in Carpinteria Salt Marsh Nature Park. Turn right and park along the street. These photos were taken in January of 2013. Click to enlarge. 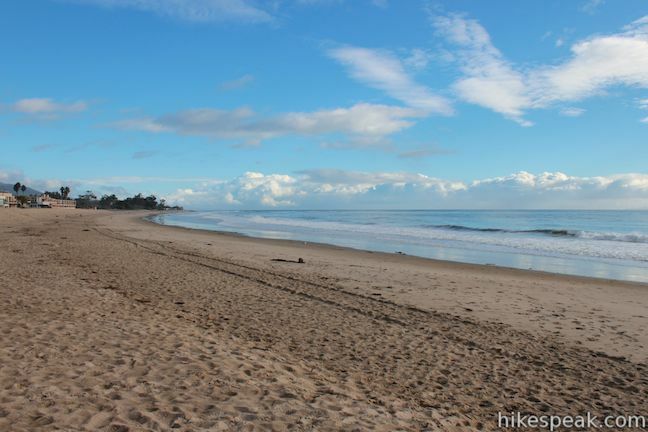 This 1 to 2-mile hike goes from Carpinteria Bluffs Nature Preserve to a viewing area above a harbor seal rookery, offering beach access and beautiful oceanfront hiking. 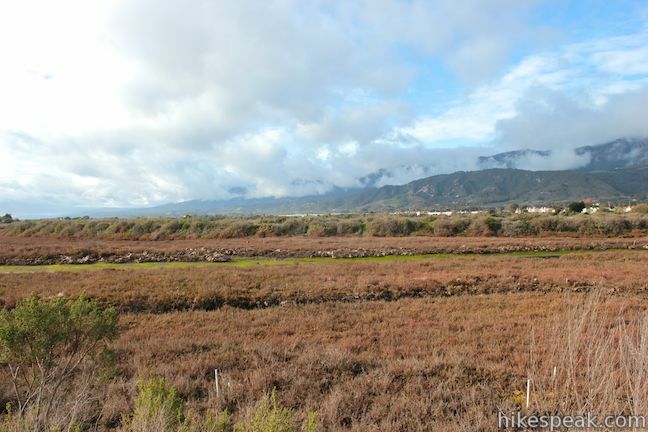 This easy 1.85-mile lollipop loop crosses charming stone bridges over San Ysidro Creek to explore a lush oak forest that is flooded by nasturtiums in the spring. 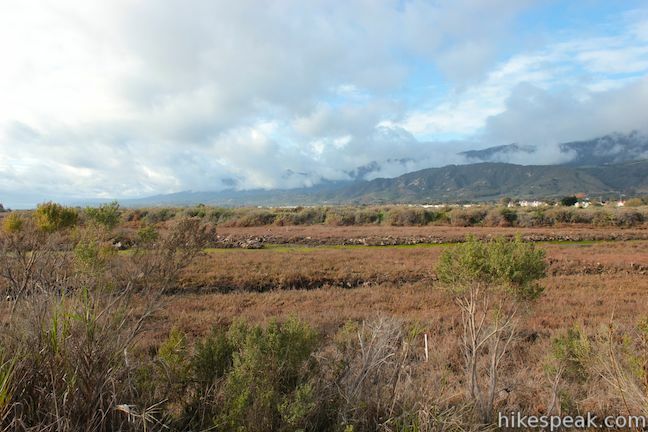 This very short trail looks in on Native American rock art in the Santa Ynez Mountains. 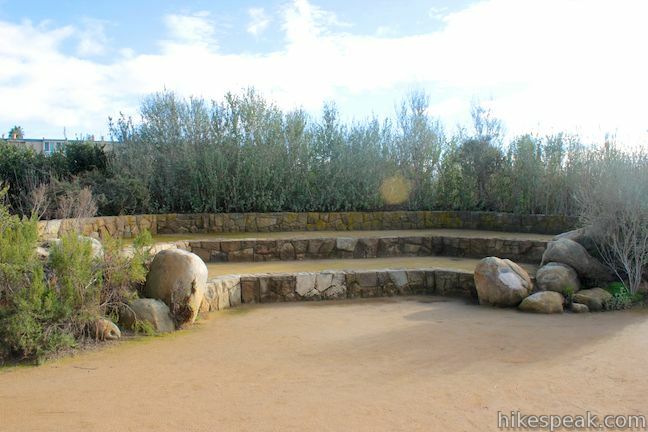 You might want to add the historic Franklin Trail to your listing. It is 7.9 miles with 3692 feet of elevation gain though the last 2.5 miles are on National Forest property and have not been open yet. This last section has been closed for years and is hazardous. The trails committee plan to open it in a year or so. The lower section starts at the end of Meadow View (a left off Linden Avenue toward the mountaisns)and the Franklin Creek bridge. 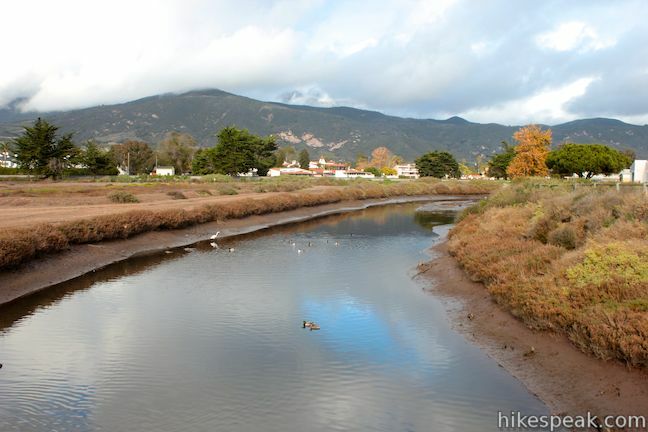 You walk along the creek, cross Foothill Road, and go toward the left (west) side of the high school where the trail starts by the chain link fence. The first section goes around the high school then winds through orchards until it breaks out into the chaparral. It switchbacks up the mountain until it joins the Edison Road leading eventually to the National Brushlands part of the trail that is closed for reconstruction. The open section is about 5.4 miles. 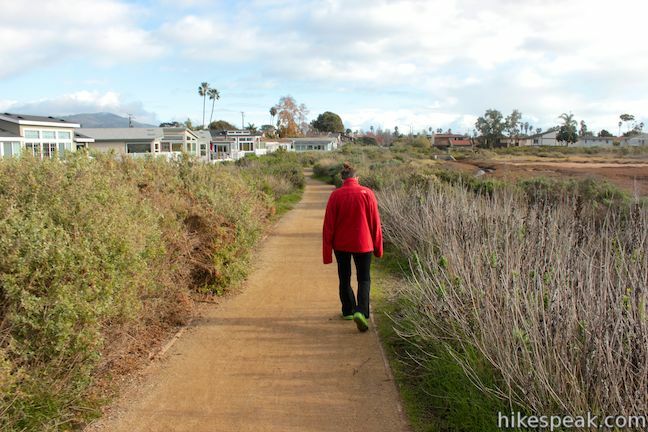 There are spectacular views across the Pacific to the channel islands, and there are beautiful chaparral plants along the trail. Great site! 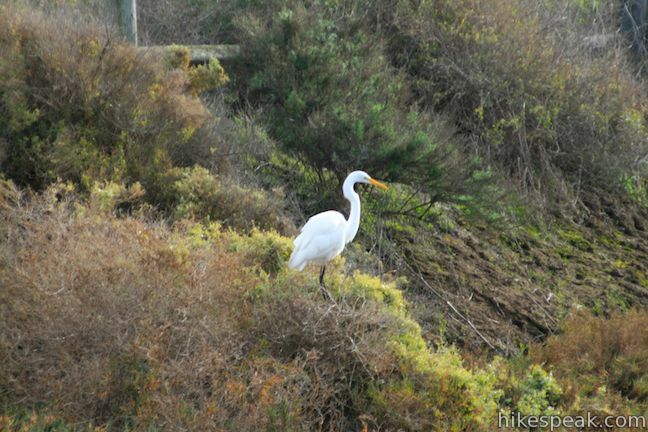 I appreciate all your attention to detail, so I thought you might like to know that your photo on this page is of a Great Egret, Ardea alba. 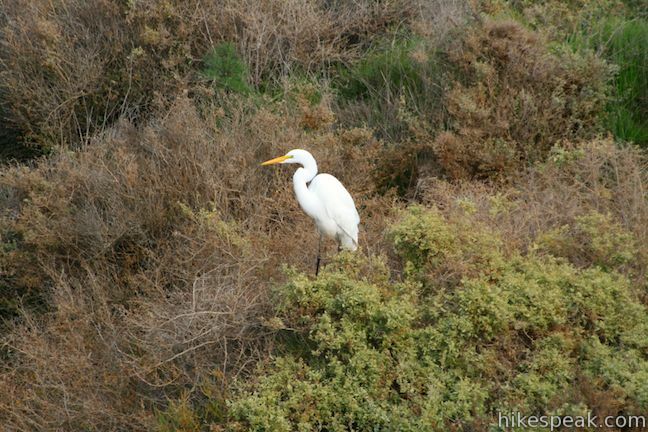 A Snowy Egret is much smaller and has a black bill. Thanks! I’ve made the correction.